Albany Premium Water prides itself as the leading water bottlers and suppliers of Premium table water packed directly from the source using the latest technology in water purification. With all the different types of water out there it canbe very easy to get confused about which types ofwater are the best for your health. It is for this reason that we introduced Albany Premium Water to clear concerns of bottled water.We guarantee that our water is safe enough and meets the drinking water standards. We offer you a revolutionary new service: Our program provides all your water needs at one fixed monthly price. We’ll set you up with a cooler and a steady supply of Albany Premium table water delivered right at your door step. 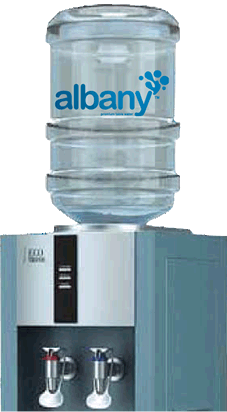 Albany Premium table water comes in 5 gallon tamper proof bottles and is dispensed through a compact, attractive water dispenser providing both Cold & Hot water. It only takes up one square feet of space and no plumbing is required. 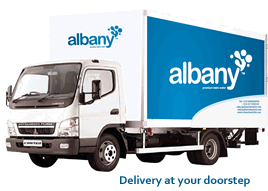 Our online & advanced computer system ensures automatic & prompt delivery of Albany Premium Pure Natural Water bottles every week to your door step.